JSC Malkų Įlankos Terminal is a stevedoring company founded in the year 2000. 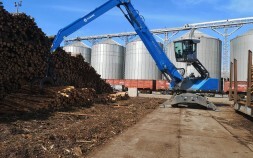 It began operating as a specialized round timber terminal. 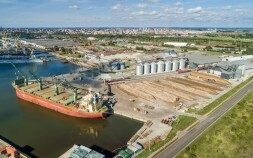 Due to the continuous development, the Terminal today is one of the most agricultural products handling terminal in Klaipeda. 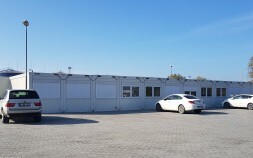 The company also successfully handles the bulk products of the construction industry and various other general cargo. Today MIT cargo handling capacity exceeds 1,8 million tons per year. 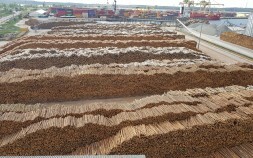 In bulk terminal we handle bulk agricultural products (grains, oilseeds, granulates), wood pellets, etc. In wood terminal we handle round and sawn timber. 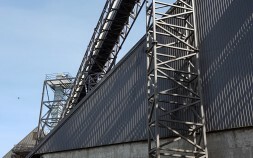 In dry bulk terminal currently we handle crushed granite, aggregates, peat briquettes, etc. The first one new loader has already been delivered to MIT. In September, the administration of MIT settled down in new office. In July 2017, MIT opened a complex of agricultural services. Today we are delighted that 5 ml. Eur investments in the expansion and improvement of the spectrum of services pays off. 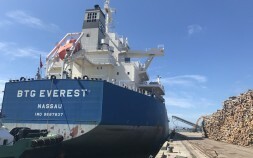 MIT has loaded 44 000 tons of grain from the warehouse to Panamax vessel . BTG EVEREST is 229 m long. MIT is a socially responsible company, which guarantees not only good working conditions, but also takes care of the health and well-being of its employees in old age. The paper industry, which has experienced a major downturn in recent years, is recovering strongly. Growth is associated with an increasing demand for packaging paper (cardboard) in the world. Intensive dredging works began in Malku Bay. It will be one of the largest infrastructure development projects launched by the port authority( JV KSSA).